This page features a Utah map and a World Map Printable and Free. Scroll down for links to other free printable maps. If you got here from the Map Quiz page and you guessed Utah, you are correct. 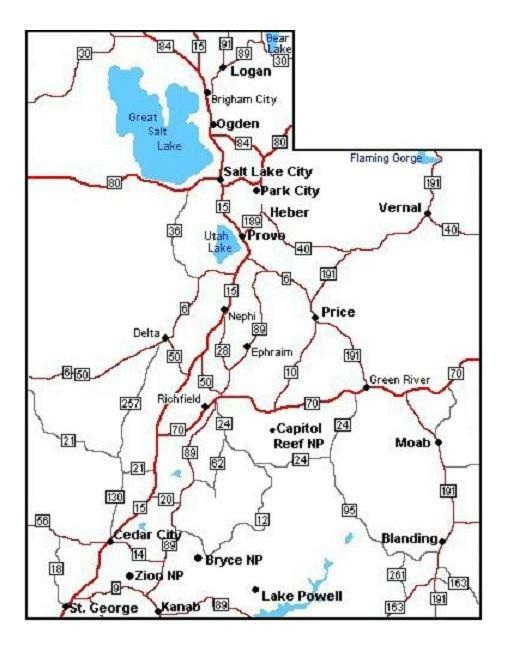 To print this Utah map, just right click on the image and select a save option from your drop down menu. This will send the image to your picture file for future use. Reduce or enlarge the image and adjust page margins as needed for best printed results. Utah was the 45th of fifty U.S. states admitted to the Union. Utah was named after the Native American Ute tribe (pronounced OO-teh). For many thousand years before the arrival of European explorers, Utah was populated by the Anasazi and Fremont indigenous tribes. Their homes were straw huts and mountain caves. Today, more than half the population of Utah follows the Mormon faith. In land area, Utah spans nearly 85,000 square miles and is the 13th largest state in America. The state of Utah is perhaps most commonly known for its primarily Mormon population. More than 50 percent of the state's population are members of the The Church of Jesus Christ of Latter-day Saints (a.k.a. the Mormon Church). The region was settled in by a group of Mormons led by Brigham Young back in 1847. Due to its stunning landscape, Utah is a popular destination for tourists seeking outdoor recreation. The land is marked by majestic mountains, valley pine forests, arid deserts, and breath-taking rock formations. Utah's Great Salt Lake is the largest salt lake in the Western Hemisphere, and is four times more salty than the Pacific Ocean. Roughly eighty percent (80%) of Utah's resident population lives in and around Salt Lake City. Utah's chief industries are mining, cattle ranching, salt production and government services. For a more printable maps, charts, data tables, and an assortment of other free printable items, visit any of the links shown on this page. Click here for a free WORLD MAP printable.